Final sea day. Final day of the cruise. Back to reality tomorrow. Fortunately we will enjoy this day to the fullest and that means starting with an early morning character breakfast with Shrek, Fiona and of course, Puss in Boots. 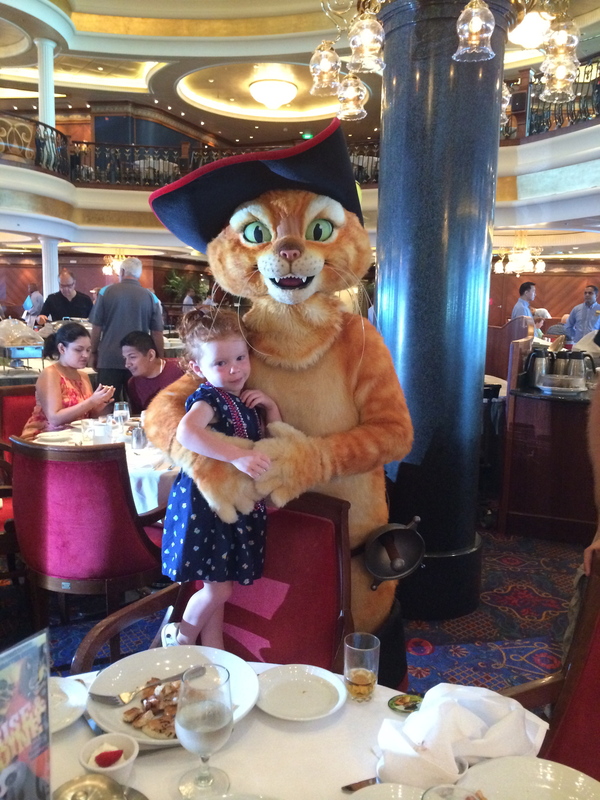 KT has no fear of characters so she really enjoyed this breakfast. Not to mention that the entire meal is chocolate themed…what kid wouldn’t like it? For me, after six days of hot Caribbean sun and fun, coffee is what’s for breakfast. Ok, maybe some Bailey’s too…if you insist! After breakfast no one seem inclined to do anything too strenuous, seems all this sun, fun, food and fresh air was taking its toll on all of us. We managed to drag ourselves up to the pool (Squeeze Bar) and park it on a lounger for a good portion of the day. In the afternoon, it was time for the semi-finals of the slot tournament, so down to the casino we headed. If you remember, P qualified on Day 2 and I won my qualifying round on Day 3, ruining my manicure and seriously hindering my ability to move my drinking hand for the next 24 hours or so. Fortunately, they serve straws with all the drinks so I never had to lift them anyway! So P and I are in the semi-finals. 15 slot players in three rounds, winner moves on to the finals. I knew how much my hands hurt after one round, playing two back to back was going to be a challenge, but I was willing to give it a shot! Plus its just fun to yell and scream at people! Well, believe it or not…I won my semi-final!!!! That meant that I would participate in the final round, immediately following the three semis. I could barely move my arms, but the chance to win a free cruise or cash was incentive enough for me! I had a 1 in 3 chance, right? So on to the finals. There are three of us standing at our assigned slot machines waiting for the countdown. And when the bell rings: BAM, BAM, BAM. Off we go mashing that button like crazy people! In the grand scheme of things, five minutes doesn’t seem like a very long time, but trust me…about 2-3 minutes in to this competition, it felt like the longest five minutes in the world!! The end result? I came in 2nd place. Royal Caribbean advertises a free cruise for two to the winner, but there is a caveat to that. They have to have had enough entries across all the round to meet a certain threshold in order to award the free cruise. That did not happen, but since I finished second, it ended up being better for me anyway! First place got $500, and I got $350! If they had given away the cruise to the 1st place finisher, I would have gotten nothing! Still, it was a fun event, and one I had never done before so all in all a win. We spent some more time before dinner with our favvie bartender Erwina. We had been telling her about a shot that tastes like a gummy bear, so she wanted us to teach her that one…we tasted as she practiced getting it right…the sacrifices we make! That night we returned to Portofino’s for dinner. After our AMAZING experience with Patrick several nights earlier, we were eagerly anticipating our second trip, especially since we knew that Portofino’s was going to be replaced with Giovanni’s Table in the next couple months so this would be our last opportunity EVER to eat there. We had requested Patrick again, but alas, he was already spoken for (by the ship’s officers, as it turns out!). Our server that night was good, but not Patrick. Still, the food was amazeballs, and Bryan, the Casino Host sent us over a bottle of wine with dinner…a pretty good one too!! After dinner, we had to finish the dreaded packing and setting out of the suitcases that really signals the end of the cruise. My least favorite part! We needed a couple of trips to Guest Services to ensure that everyone had the same departure number, and then we headed to the casino for our final donation to the RCCL Future Ship Fund. If you are currently sailing on one of the new Quantum Class ships…You’re Welcome. In the morning, we met at the Windjammer for breakfast then headed off the ship. There is nothing sadder than hearing the last “bong” when they scan your seapass card for the final time. We had some delays in Customs, but were on our way in short order and back on the road home. We had a fantastic time, great food, amazing weather and all in all, a thoroughly enjoyable vacation. For us, the drink package is totally worth it, your mileage may vary. Of course, I booked my next cruise already, but before that…VEGAS BABY!